ZF Friedrichshafen AG put all of its intelligent components into its 'Vision Zero' autonomous prototype, and we took it out to see how it drives. I have been eager to see how an autonomous vehicle would really perform on road. The technology has seemed mighty promising on paper, but practical implementations of artificial intelligence and relying on machines while driving on road isn’t something too straightforward an affair. More importantly, it has also been an interesting quest to find out how much modifications an autonomous car would need, and how the interiors would be. 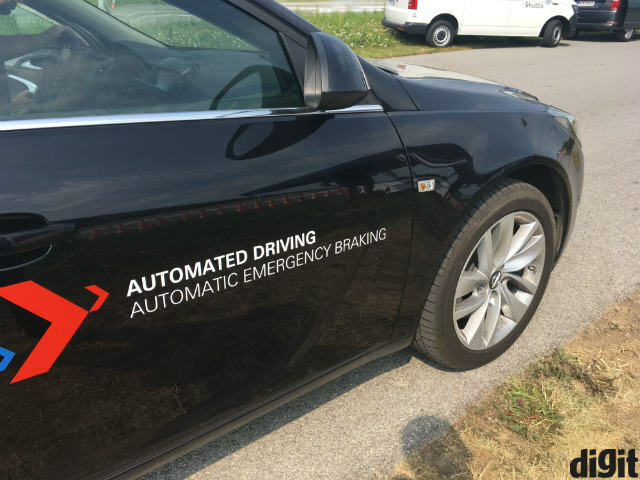 It is this that we got to experience at ZF’s Vision Zero test track in Pachfurth, Austria. 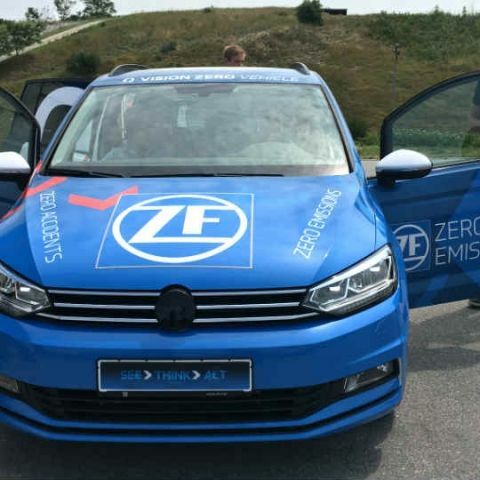 The prototype vehicle that ZF is using to test its technology is a modified Volkswagen Touran - a compact family SUV that focuses on safety. Modifications on the inside include reinforced safety belts that automatically adjust and provide haptic feedback according to the motion of the vehicle, a massive Tesla-esque touchscreen interface that provides access to steering control, rear/front/all wheel drives, different levels of assisted and autonomous driving, and microcontrollers for automatic steering control. The rest of the vehicle, apart from the tattooed paint job, was surprisingly unassuming. ZF’s new, reinforced seat belts are adaptive, so when you step into the car, they automatically raise themselves in height to let you fix the belt easily. It then provides haptic feedback depending on your seat and sitting position to fit itself adequately. The rest has no difference from the regular vehicle - you simply start the vehicle and set off as you would. Putting in adaptive mode, when I drove into a one-way lane, the array of sensors read the road signs, alerted me on the smaller, secondary LED display that I’ve entered the wrong way, and automatically braked. The auto brakes and alarms also engage as soon as you put the indicator towards a wrong way. Farther down the track, as I approached road bumps at nearly 60kmph, the sensors gauged about 100 metres from the bumps that I’m not slowing down, and automatically tightened the seat belts and slowed the car down. Interestingly, when I switched to autonomous mode and let the steering wheel take control, the car simply found a path around the bumps and maneuvered itself to avoid the obstacles. The large central display that ZF has implemented here is of really high resolution, and the 3D gauge takes data from GPS, radars and imaging sensors to show an accurate representation of the road. Alongside, it also shows a predictive track that the car is going to take, including the trajectory around bumps and turns. 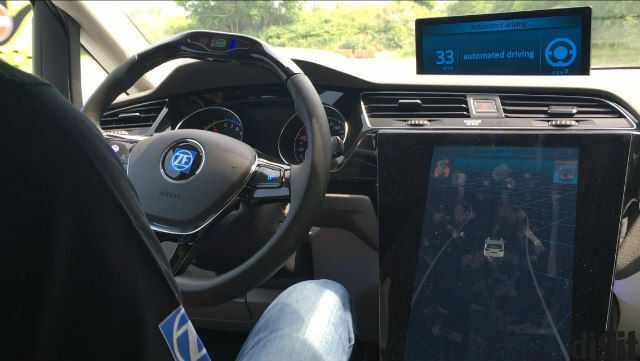 ZF’s prototype Touran is equipped at the core with Nvidia’s Drive PX 2 platform, and has other companies like Astyx, e.Go, Hella and more that contribute for the individual components. All the individual camera modules use Mobileye’s EyeQ3 chip, while the larger multi-cam modules use the new EyeQ4 chip. ZF manufactures and develops much of its components and firmware by itself including the lidar. Software platforms are all open source, meaning that the algorithms that power ZF’s Vision Zero vehicle, can also power an OEM’s vehicle. The Touran here is equipped to go up to Level 3 autonomous, but development till now restricts its present application only to Level 2. While the ride itself is quite underwhelming, what’s overwhelming is the ease and efficiency with which the cars drive themselves. From the 3D imagery to predictive turn suggestions, automatic braking and every individual element, everything has a cohesiveness to their operations, although the car could not take very sharp turns by itself, yet. It almost feels like second nature to have your car simply drive around obstacles, or slow down and brake when it detects a pedestrian. The true essence of development lies in seamlessly fitting it all into our everyday lives, and that is where I took heart in this brief tryst with an autonomous car in a controlled environment. ZF itself says there is a long way to go before car cabins turn into living rooms, but if this is the level of precision and accuracy that is shaping up our future cars, I see no reason to be skeptical of their implementation and access to the public. @ravi, I lost that file. Now what I have to do? How to unlock an External Hard drive which got locked during encryption?